Steve Millard, president and CEO of the Greater Akron Chamber, is new to the job but no stranger to Northeast Ohio or the work he is taking on as leader of Medina, Portage and Summit counties’ lead economic development agency. “I’ve spent the last 21 years in the economic development space,” explains Millard, who assumed his new role in June. That time was spent just down the road in Cleveland, where Millard served as vice president of the Greater Cleveland Partnership (GCP) and executive director of its Council of Smaller Enterprises (COSE). Millard, who grew up in a rural community outside of Philadelphia, points back to his childhood as the start of his interest in business. “I grew up in a family that always had a hustle on the side, but it wasn’t called a hustle at the time. It was called making ends meet,” he says. “I’ve always had this affinity for small business and entrepreneurship.” He graduated from Syracuse University and got his MBA from Case Western Reserve University. His work with Andersen Consulting’s Supply Chain Strategy Practice brought him to Cleveland in 1994, and he and his wife, a native of the area, decided to build their lives in Northeast Ohio. 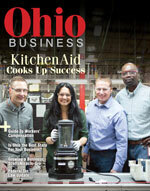 Millard started with GCP’s predecessor, the Cleveland Growth Association, in 1997 and began leading COSE in 1998. In his 21 years in the field, Millard’s focus has been on small business development and advocacy, work that he’s found to be interesting and satisfying. 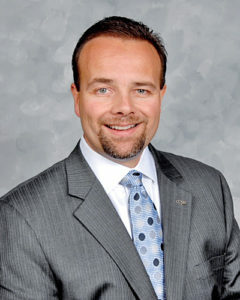 When the opportunity arose for him to lead the Greater Akron Chamber, Millard says he wouldn’t have considered it if he were expected simply to stay the course. Instead, Millard is stepping into the role alongside other civic and business leaders who are relatively new to the scene in Greater Akron. “I think there is a lot of institutional and organizational change going on,” Millard says, noting changes in leadership in government, with Mayor Daniel Horrigan taking office in 2016 (he was the city’s first new mayor in 28 years), and at places such as the new Bounce innovation center. Millard sees this an opportunity for the city’s leading institutions to come together and map a future that builds on good things that already are happening here. 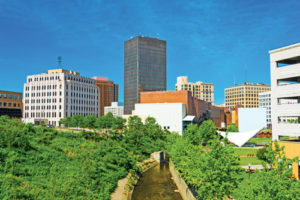 As for what Akron is doing right, Millard notes Bounce, an innovation hub that supports entrepreneurs that opened last year; efforts by Stark State College and other institutions to address workforce development issues; and new development in downtown Akron, among other initiatives. “Those are some of the things I think are percolating right now that will be demanding a lot of attention from myself and Akron’s leadership, and the engagement of the business community,” he says. Engaging with that community is among his top priorities, as he views business leaders’ input as crucial. “The business community has to be part of these dialogues,” he says. Dialogue is his No. 1 goal as he gets started. “The first thing is just to get out and talk to leaders in the community. Business leaders, civic leaders, but also our small business owners in Greater Akron.” Those conversations will help guide a strategic planning process Millard will lead. “I’m really interested in hearing from people in Greater Akron … about where they would like to see the chamber do more, and what the chamber needs to do better, and what the chamber needs to continue doing,” he says.